In 1905, Winsor McCay created Little Nemo in Slumberland, a weekly comic strip about a boy and his dark, surreal dreams, that is now considered to have been far ahead of its time. Eighty-four years later, an animated film named Little Nemo: Adventures in Slumberland was released. 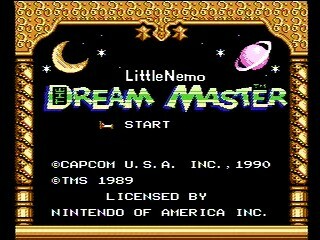 This was then adapted by Capcom into Little Nemo: The Dream Master, released in September 1990 for the NES. The result was an interesting platformer that featured diverse levels and a variety of animals for Nemo to ride. Best time: 0:24:44 by 'HavocProdigy' on 2013-09-21. First and foremost, I should point out that this is probably my favorite video game ever. I still have fond memories of completing this game way back in the early 90's and of renting the movie at West Coast Video for a weekend sleepover. Nemo's trip to Slumberland is a phenomenal adventure with eight unique and surreal stages. Slaying the Nightmare King and rescuing Princess Camille is still incredibly rewarding for me, even after all these years. I imagine that I will still be running this game for years to come until both my hands and my brain can no longer cooperate enough to run it at a high level. While this isn't my first submission to SDA, this is the first game which I became serious about speed-running. I've been sitting on a couple of very polished runs for a while now which I could have chosen to submit. However, I was not content with submitting a "pretty good" run. Nothing short of a great run would be acceptable for me and this game deserves no less. While it was tempting to submit my first sub-25 minute run, I knew that I could continue to push this game to higher levels of play. This run turned out so well that I am going to have an unbelievably difficult time improving it by 5-10 seconds. Because most of the run is pretty self-explanatory, I will keep my individual level comments fairly short. Mushroom Forest: I use a pause glitch at the very beginning to skip Flip's long dialogue. This same glitch will be used at the beginning of levels 2 and 4. Every opportunity that I can, I damage boost off of enemies to save precious seconds. The damage boost into the mole transformation is the trickiest part of this level. Flower Garden: This level contains the only intentional death in the run which is done to save a couple of seconds. Much like the previous stage, I damage boost off of a giant bird and into the lizard to transform instantaneously towards the end of the stage. Because of how difficult this stage is and because of how well this actually went, this is one of my favorite parts of the run. House of Toys: Since most of this stage is an auto-scroller, there's not much for me to say about it. I spend most of the level jumping around and ducking like an idiot and bouncing candy off of enemies since I'm very generous with my snacks. Night Sea: The only real blunder in this stage was getting bounced back by an enemy while swimming as the frog. I spawn a tadpole enemy in a desirable spot late in the level to avoid that same enemy spawning near the 2nd hermit crab. Nemo's House: The text skip at the beginning of the stage is a precisely timed jump as soon as the level begins. This jump allows me to skip the text from Oompo. A lot of rough spots in this stage can easily end the run. Overall, I'm fairly satisfied with this stage. I failed to break a couple of blocks in a timely manner late in the stage. Overall, I only lost a couple of seconds here. Cloud Ruins: As fun as this level is, there are a few terrifying parts that can end the run on the spot. I forego the text skip because it's short and it takes more time to position yourself correctly on the roof than it does to just tolerate the 2 screens of text. The deadly cloud jump early on goes pretty well. At the very end of the level, I go for the riskiest damage boost in the whole run by stunning the snail and then bouncing off of him to the right. Topsy-Turvy: I have nothing to say about this level other than the fact that this was the quickest I have ever completed this stage. Nightmare Land 1: The Penguin boss should ideally should die in 5 charged shots. However, because he tends to die whenever he feels like it, this is by far the most random part of the run. Most of my runs that reach this point end when the Penguin takes more than 5 shots to kill. This was just barely the fastest that I've ever completed Nightmare Land 1. Nightmare Land 2: The damage boost as the lizard near the top of the 1st room is probably the most well-known trick in this game. I boost off of an enemy as the lizard to reach the top without having to transform into the frog. The only real time that I lost here was waiting for the spike ceiling to ascend right before the boss. In retrospect, I probably could have just barely gotten through without waiting. However, if I'm wrong, the run ends there and in actuality, this mistake only cost me about 1 second. The Sting Ray boss dies both predictably and off-screen. Nightmare Land 3: My Nightmare King fight was mediocre. Unfortunately, the final hit took me several seconds longer than it should have. Other than that, this level was great.